This classic onion tart recipe is so delicious and it will give you a substantial meal for lunch or supper - or when you want a great tasting snack. 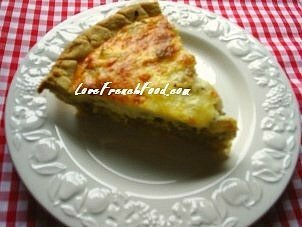 We all know that the French know their onions of course, they are used often in all kinds of dishes and sauces, so it comes as no surprise that they enjoy them in this gorgeous pastry dish. You don't need a fancy quiche dish for this one as traditionally it would have been made in a straight sided dish or tin without the fancy edges. This quiche is tasty at anytime of the year - cold with salads in the summer or hot straight from the oven to warm you on a cold winters day. It will serves five to six people – well, depending on how good you are with the portions – you will probably want a good sized piece all for yourself, it is so good. This onion tart recipe is sure to be a favourite! It is so tasty and will go down well with a green salad and a glass of your favourite wine. It is also so easy to make and is a very economical meal for a hungry family! · 1 partially cooked pastry shell (Please visit here to find the recipe and instructions to make the shell. Your pastry shell should be just cooked but still pale in colour. · Melt the butter in a heavy based pan and cook the onions gently until they are just cooked and golden brown in colour. · Stir in the thyme leaves and leave to cool. · Whisk the eggs lightly then whisk in the cream . · Add the cheese and the salt and pepper to taste. · Fill the pastry shell with the onions. · Pour the egg and cream mixture over the onions. · Bake for about 30-45 minutes or until golden brown and the egg mixture has puffed up.